When teaching about families in crisis I like to specifically focus on a select few that often vary from one year to the next. However, I also like students to be aware that there are a multitude of crises that families can face throughout their lives. In order to make them aware, I like to have students select a crisis and find an article about it to read and summarize. After summarizing and connecting their feelings to the issue, I like to have them make a classroom quilt square depicting their selected crisis. When put together, it makes a statement about specific crises and draws others in to make them aware of issues facing families today. Note: If you have sewing machines available this project could easily be adapted with quilt blocks being constructed with fabric. Pass out whiteboards and ask students to define the term crisis and give an example. Whip around the room having students share both their definition and their example. Most students come close with their definitions, but I like to give them the following: A crisis is a radical change in a person’s life often caused by a build up of stress or by an emotionally significant event. Go over the project guide sheet with students and have them select a topic to learn more about. You can decide the order of selection, but I have a can of numbers and students randomly select a number and then students choose from that order. It’s the luck of the draw so I tell students to have several topics in mind in case their first choice gets taken. Students will then create a construction paper quilt square (size determined by the teacher…mine equaled 8 x 8 inches minimum and up to 12 x 12 inches maximum depending on the size paper or fabric I was using) that depicts your crisis. Be creative and clear (In other words, nothing too abstract; we should be able to clearly recognize your issue.) You may create this with magazine pictures, fabric, scrapbook paper, yarn, embellishments, paint, markers, colored pencils, crayons or any other mediums you would like. Oral presentations will be made by the students to share and explain the quilt square depiction of their topic and why they chose to illustrate it the way they did. 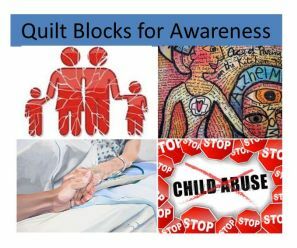 The quilt will then be hung in the classroom, hallway or cafeteria to help raise awareness.